Slovenia is situated in the heart of Europe, bordered by Italy, Austria, Croatia and Hungary and this two centre holiday explores contrasting areas of this beautiful country. Traverse the peaks, deep valleys and gorges in the shadow of the Triglav National Park and marvel at the lakes and crystal clear waterfalls in Lake Bohinj. Our base for the first 3 nights is in the charming alpine village of Kranjska Gora, which enjoys sweeping vistas over the Austrian and Italian Alps. In the winter it is a popular ski resort and is renowned for hosting the annual World Cup Slalom every January. Our first charming walk will take us through the beautiful Jasna Valley. At the end we’ll be greeted by the glorious mountain area of the Prisank and Razor Mountains. We can enjoy a typical hiker’s lunch in a Krnica hut (extra charge). For the following 4 nights our base is in the heart of the village of Bohinj with fantastic views over the famous cobalt-blue lake. This beautiful fairy-tale-like region is often described as having apparent special powers to restore well-being and offers fantastic walking opportunities. In your free time why not visit the nearby Lake Bled? From there you can take a pletnas (a traditional wooden boat) to the island in the middle of the lake where you can walk the 99 stone steps to reach the Assumption of Mary Church, an island steeped in mystery. Legend has it that if you ring the bell of the church it makes your dreams come true! 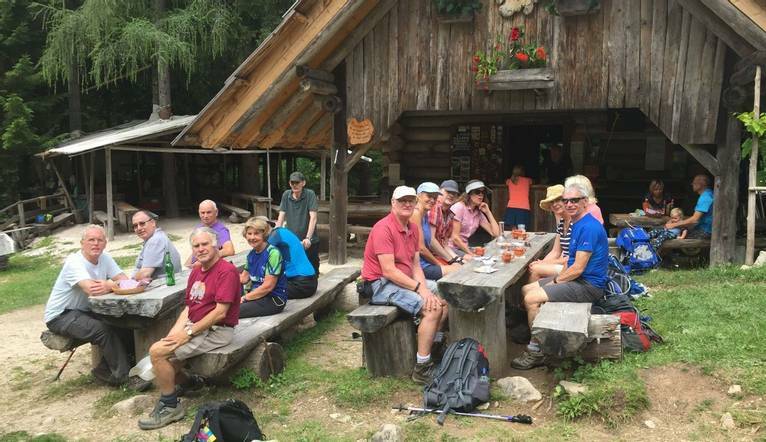 After driving up to Pokljuka Plateau, we will begin our hike across the mountain pastures and rustics farmhouses to a viewing point at Bohinj Valley. As we descend, we can stop at the little historic gem of Studor and see how people lived 150 years ago. Our final destination is Lake Bohinj, a true gem in the Triglav National Park, and the small fisherman’s settlement at the beginning of the lake. We spend the day strolling around this peaceful alpine setting, in the shadows of the Julian Alps. Here, we can swim in the crystal clear water and even try the delicious Bohinj trout. At the western end of the lake there's a short trail up to the Savica Waterfall, the source of the lake and the Sava Bohinjka river. From here we can take the cable car up to 1532m Vogel Mountain for a spectacular view of Mount Triglav, the highest peak in the Julian Alps. Perhaps we could spend the evening in one the cosy village pubs and sample some of the home-made honey brandy? Beautiful area, very peaceful setting in Bohinj and wonderful walking. I had a wonderful holiday and made great friends! The scenery was beautiful and the walks were varied and challenging. The Tour Leader and local guides were also really helpful in suggesting places to visit on our days off. Please note that the itinerary can be subject to change. The transfer time from Venice Airport to the first hotel is approximately 2 and a half hours, depending on weather and traffic. Four guided walks are included in the programme. Your walking guide will advise you in resort of the daily programme. The walking programme is graded as Medium and you can expect to walk between 7 to 14km per day, with some ascents/descents, rough underfoot terrain. We suggest a Group Collection to cover transfer drivers, and hotel staff of €15.00 per person. Your Tour Leader will collect this on your behalf and distribute it accordingly, thus relieving you of the burden of who, when and how much to tip. The tipping of housekeeping will be left to your individual discretion (a small amount left in your room on departure should cover this and would be much appreciated). As is customary, ‘the hat’ will be passed around for the driver and guide on all optional excursions. For any meals that are not included in your itinerary, or taxi fares, your Tour Leader can advise of an appropriate % add on.